From June 25 – July 17, a thrilling 40-metre long, four-metre high ice slide will be set up alongside Southbank’s waterfront for kids, parents and the whole of Melbourne to enjoy. 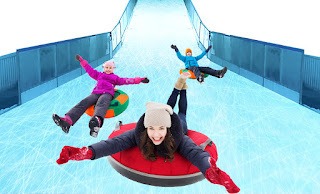 You won’t go hungry after your experience on the Variety Ice Slide, with The Food Truck Park setting up from 11am to offer hot, fresh and tasty food. Also, River Rink in Fed Square and Eureka Skydeck have joined forces to offer you the opportunity to enjoy a great day out in Melbourne at some of the most iconic and unique attractions the city has to offer. Purchase a ticket to Eureka Skydeck and you will receive a 20% off admission voucher to River Rink in Fed Square. Voucher must be presented at the River Rink in Fed Square box office to gain discount. Click here for pricing and more information about this offer. Eureka Skydeck, in partnership with MIRVAC and Fuze Tea, will donate a portion of the funds to not-for-profit organisation Variety: The Children’s Charity. The Variety Ice Slide is brought to you by Eureka Skydeck, MIRVAC, Fuze Tea and Variety Children’s Charity. No, you can simply purchase tickets at the slide. Do I need to bring wet weather gear? No, regular clothes are acceptable. Is there a cost for children under 4? No, children under 4 can ride free on a paying adult’s lap. Are there any age/height requirements? No, there are no age or height requirements to slide.